Did you know that every year in the UK over 200 people are killed and several hundred thousand more are injured or suffer ill health whilst at work? You can make a big difference where you work, by always working safely and looking out for others. This is not just the right & sensible thing to do, it’s also the law! HASAWA also states that you must co-operate with your employer in all health & safety matters, this means it is your lawful duty to; 1) Observe safety rules & policy. 2) Use equipment provided for safety. 3) Attend safety training as required. 4) Report any unsafe situation or practice. 5) Know the safety procedures for your particular job & area. 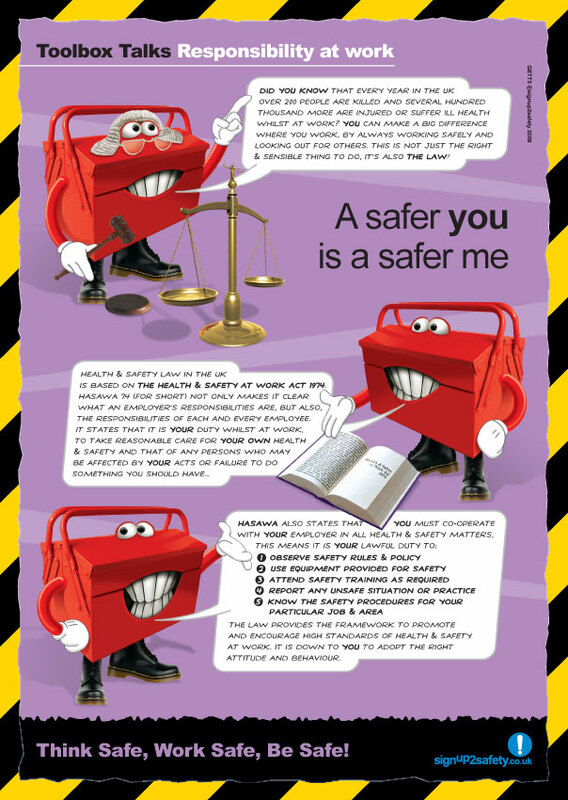 The law provides the framework to promote and encourage high standards of health & safety at work. It is down to your to adopt the right attitude and behaviour.